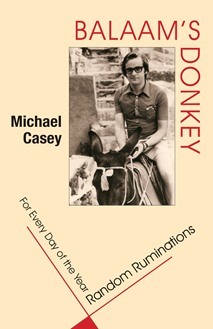 Balaam's Donkey is a series of daily reflections based on the homilies preached by Cistercian monk Michael Casey over his fifty years of priesthood. What remained of the original homilies was a large box full of index cards with a few talking points on each. From there, Casey has re-created the homilies and recast them into short reflections, arranged randomly for every day of the year. The range of topics discussed is broad and the approach taken differs with each reflection, most of them colored with a touch of Casey's whimsy and good humor. Michael Casey, OCSO, has been a monk of Tarrawarra Abbey (Australia) since 1960. In the intervening years he has conducted many retreats and workshops on every continent (except Antarctica) and has written many articles on topics relating to monastic history and spirituality. He is also the author of many books, including The Road to Eternal Life: Reflections on the Prologue of Benedict's Rule and Seventy-Four Tools for Good Living: Reflections on the Fourth Chapter of Benedict's Rule, both from Liturgical Press. "Casey's `repurposed' homilies are the best fruit of lectio divina. Where ever you stick your thumb in, you pull out a spiritually wise and theologically thought-provoking plumb. Engaging turns of phrase and energetic prose promote reflection that is both sweet and sustaining." "In this eclectic collection of short homilies for each day of the year, Michael Casey brings surprise, challenge, comfort, and encouragement to the reader who wonders at the workings of God in everyday life. His usual sharp wit, profound insight into the very heart of the human condition and the scriptural text, along with his uncanny ability to make the quirkiest of connections with all manner of sources, make this work an apt companion to one who desires a word of wisdom as they journey through a year of seeking God." "Balaam's Donkey is the work of a creative genius. Who else but Michael Casey could take the leftovers of 50 years of homilies, and serve up a splendid meal? The table of contents is comprised of 366 words, giving us one word leading into a reflection for each day of the year. Who else but Michael Casey could take words such as `and' or `cold water' and let them lead us into a meaningful meditation for the day? "As these words find an echo in your heart you begin to feel, more than see, the interconnectedness of the book. Casey calls it `random ruminations' but I noticed after reading the meditation for the day and putting the book down, I felt better about the coming day. Hope and encouragement is the golden string binding these reflections together like the bundle of myrrh' so dear to the lover in the Song of Songs 1:13."